Continue straight down the road to the business parks. 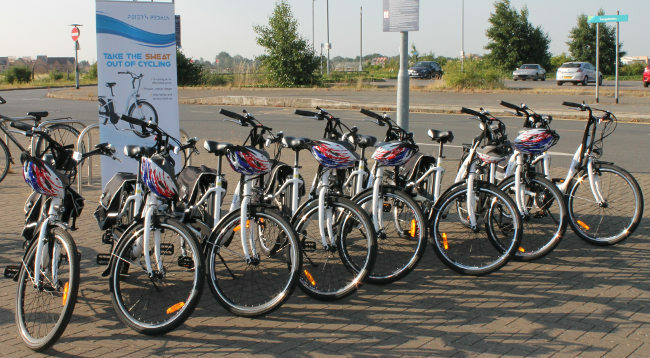 You can pick up an electric bike from 7am to 9am on weekdays. Riders are encouraged to wear safety helmets and should bring their own. 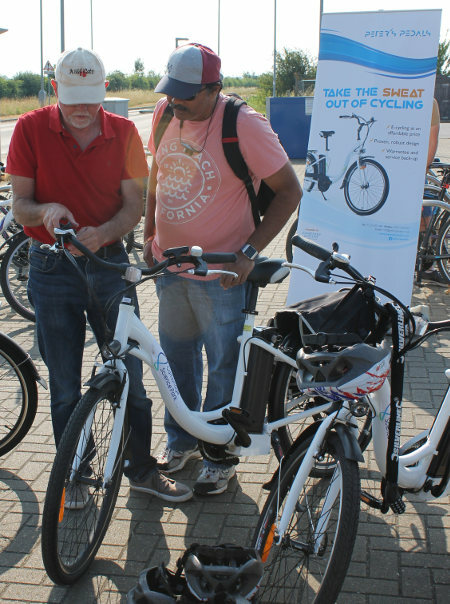 If you are delayed and plan to pick up your electric bike after 9am, SMS 07973 499 224 and a bike will be locked to a bike rack for you to use. Whilst cycling, store the lock & chain in the pannier bag. Every morning we fully charge the electric bike's battery. Our bike's range exceeds 25 miles, so there is ample power for your return trip. 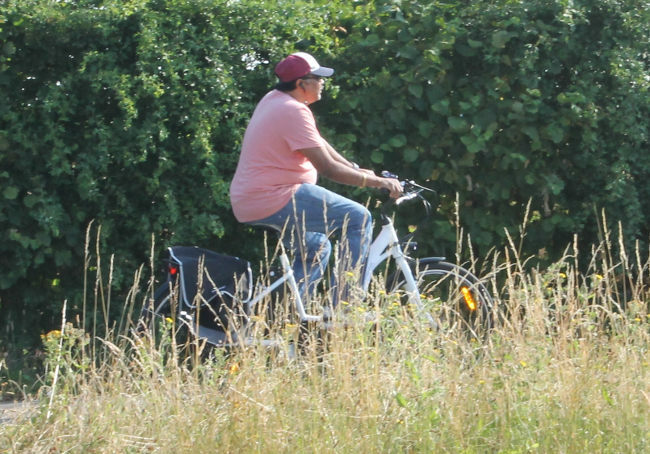 Even if your battery runs slightly low, the bike has six gears, so you can relatively easily pedal back to base. Is responsible for taking care of the bike in a reasonable and careful manner. Each day, you must return the electric bike to the location from which you hired it. We want to check the bike and charge the battery. This service is not intended to be a free, overnight, multi-day hire. Display it on your office noticeboard. 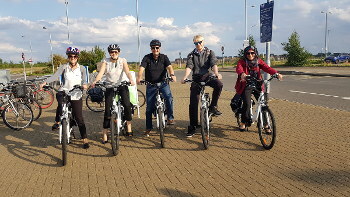 Perhaps your colleagues would like to save time, riding a electric bicycle direct to your office. It would save them queueing to access the Science Park, St. John's Innovation Centre, or Future Business Centre. The more people who use our service, the better our service will become. 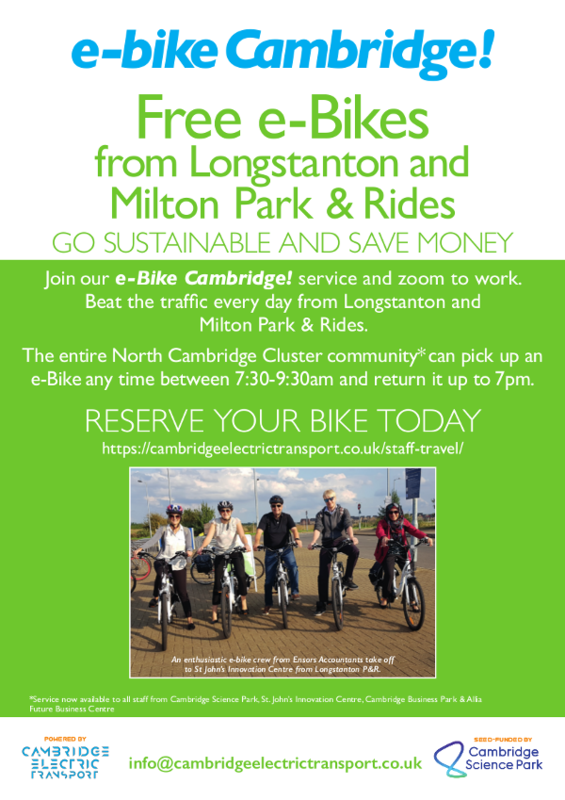 Riding an electric bike along the guided bus route from Longstanton to Cambridge North. Click on poster to download a pdf version, print it, and display in your office.